Welcome to Villa Marina, your holiday home you will never want to leave! 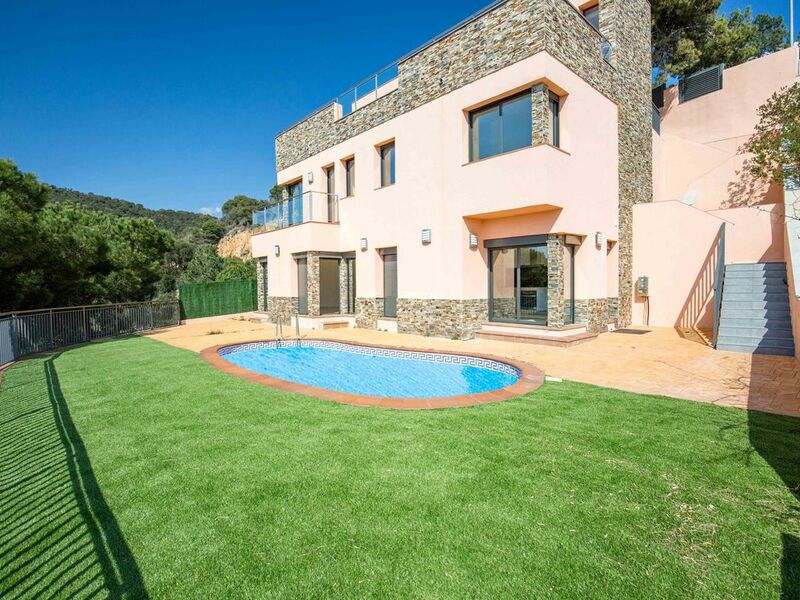 Modern luxury 3 story villa with panoramic sea views, private pool, balcony and terrace between Lloret de Mar and Tossa de Mar. Only 900 meters to gorgeous beach of Cala Canyelles and scenic Cala Morisca. The beach of Cala Canyelles is not as crowded as many other beaches in the area, and offers very nice bars, a small harbour and a very nice restaurant. You can also try waterskiing, skuba diving or hiking. Cala Morisca is one of those idyllic coves that the coast between Lloret and Tossa has to offer. This modern, bright and airy Villa offers fantastic sea views, private pool, barbecue, gazebo, 2 car garage and much more. The villa is equipped with air conditioning, heating, wifi, satellite TV and much more. The decoration used modern finishes: marble floors and parquet artificial high class. When you enter the Villa, you are at the top floor with a bedroom with a double bed and en-suite bathroom, a small living room with pullout queen size sofa, and a huge terrace with stunning sea views. Terrace offers you a lot of space where you can enjoy sunrise and sunsets, or tan privately. The middle floor has three large bedrooms. First bedroom has its own balcony with amazing sea view, a large double bed, a couch, walk-in closet room and en-suite bathroom with spa bath. Second bedroom has two single beds, wardrobe and two windows with marvelous views. Third bedroom has large double bed, wardrobe and its own sea view. Also on this floor is another bathroom with spa bath. Ground level is designed as modern open concept with kitchen, dining space, and living space. Big dining table for family and friends to enjoy time together. Kitchen is equipped with all you need to prepare breakfast, lunch or dinner. You have two accesses to the big terrace from this floor. On this level there is another bedroom with two single beds. Also on this level full bathroom and utility room. Villa Marina is located in one of the most beautiful areas of Costa Brava. Costa Brava, with it's length of about 100 km, runs from Blanes to Port Bou near the French border. This makes the Costa Brava a very popular holiday destination for tourist who travel by car. In the South of the Costa Brava you will find the La Selva district, between the town of Blanes and Tossa de Mar. The Romans too knew that your days are best spend at the 'Rough Coast'. In the several fisherman villages you will find remains of this period, with the burrow of Tossa de Mar as a jewel on the crown. The kindness of the climate ( in winter the temperatures rarely drops below zero degrees and well is well above 30 degres in the summer), make it possible to enjoy this extraordinarily beautiful rugged coastline and the several sandy beaches year round. Together with the hearthwarming character of the local populace, the rich historical past, the lovely green hills and the varied exquisite kitchen makes the Costa Brava a holiday region which has a lot going for itself. Drawn by these riches, many famous artist have found serenity and peace at this Spanish part of coast. Villa Marina will give you an unforgettable holiday! This stunning villa offers you nothing but luxury! You will enjoy fantastic views over the sea from the huge balcony, the terrace, the pool and all the rooms. You will also enjoy the modern furniture and high quality finishing, BBQ and all extras. The painting over the sofa in the living room made by a local artist is almost as old as the Castell d’en Plaja itself. It is not only brings warm touch to the villa's decor but also connecting to the history of this place. full kitchen with stove top, oven , refrigerator, freezer, coffee maker, fresh juice maker, serving plates, glasses, etc. En un entorno natural, ideal para disfrutar de la familia en una casa q te ofrece.... bonitas vistas, sol desde la mañana hasta la noche, todo tipo de comodidades y mucha tranquilidad. Pero si tendría q poner algo negativo, es q en nuestro caso íbamos con una persona mayor y la casa está un poco limitada , ya q dentro hay muchas escaleras y está en un alto, así q muevas hacia donde te muevas, tienes cuestas. Pero por lo demás perfectas. Son unas vacaciones q nunca olvidaremos. Families will adore Lloret for its great amenities and attractions, with a water park, huge adventure playground and plenty of bright ideas for excursions and activities close by. In water park you can pick from 20 rides and pools, and daredevils will love Kamikaces, a crazy plunge 77 metres in height and reaching speeds approaching 40 mph. On the end of Lloret Beach is this mansion constructed by the local industrialist Narcís Plaja in the 1930s and 40s. He certainly had a taste for medieval design, because the building’s turrets and crenellated walls look like they something out of a fairytale. Lloret de Mar stands out as a family destination because kids are so well-catered for. Gnomo World is yet another attraction that places the littlest ones front and centre. This is an active outdoor fun-park, ideal for children up to the age of 12. There’s a mountain of things to do: The youngest adventurers will love the climbing areas, ball pool, crafts workshops and cartoon screenings. Bigger kids can tackle the assault course, hit the amusement arcade and take part in organised adventure tours. Puig de Castellet Ruins stands at 200 metres above the sea, a couple of kilometres in from the coast. If you’re up for the walk there’s a clear trail leading to the site, but many people catch a bus to the top in summer. You can find a big water sports centre on Lloret beach and Cala Canyelles beach, so if there’s a sea-based activity you’ve always wanted to try it couldn’t be easier to do it here. Guided sea kayak tours will get you intimate with Lloret’s rough-hewn coastline, and give you memorable views the resort framed by the evergreen mountains behind. Snorkelling expeditions are also organised from this beach. For these you’ll set off for the headlands that overlook each of the main beaches in Lloret. Here there are caves and sheltered coves with perfect water clarity for spotting marine wildlife. If you want to take your night to the next level then head for a host of clubs, including Londoner, Colossos, Moef Gaga and Tropics. For those who want something a bit more sedate try sampling Calatalan wine and cava at a bodega, paired with little tapas dishes. One of the many cool things about the Costa Brava is the way the rugged limestone mountains encroach on the seafront. A quiet walk in Mediterranean countryside, through pine and holm oak forest has to be on your list of things to do. If you’re visiting in spring or autumn you could take on the trail to the Iberian settlement of Montbarbat, which will take around five hours. There are also long-distance trails hugging the coast, like the GR92TR11, which leads all the way to Tossa de Mar, about three hours away. Allow a day to get the most out of this gorgeous city half an hour to the north. It’s a bit sad that many people visiting the Costa Brava will use Girona’s airport without taking the time to discover its medieval Jewish Quarter or walk along the battlements of its intact defensive walls. And of course the classic postcard image of Girona is the riverfront of the Onyar, where a picturesque jumble of painted old houses contend for space next to the water. The city’s churches are also exquisite: The pick has to be the Collegiate Church of Sant Feliu, with its eerie spire. Minutes up the coast is another great resort. The beaches of Tossa de Mar are hard to resist of course, but what really grabs the eye is the Vila Vella, a waterfront citadel to the west side of the main beach. It’s quite a rare sight in Spain, where most coastal defences have long been taken down. There’s a whole neighbourhood within these 14th-century walls, turrets and battlements. Every few steps on these twisting streets something exciting will turn your head, whether it’s Roman fragments, the ruins of an early-Christian church or arresting views over the pine-rimmed coast. If it all starts to look familiar, scenes from season 6 of Game of Thrones were filmed here.